Wow, what a powerful and sobering thought. Our faith in Jesus' resurrection, and our faith in being joined to him, is so crucial that all else pales in comparison. 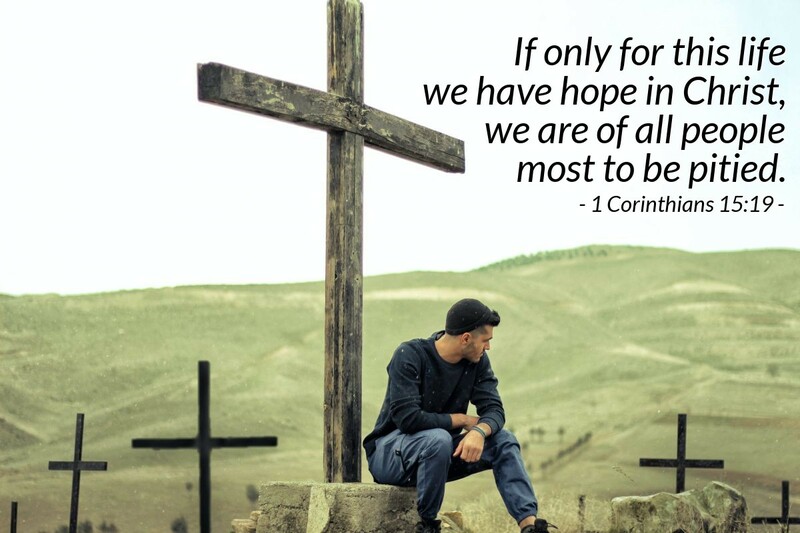 Our hope in Christ is not just for here and now, but it is also a hope that transcends life and bursts the shackles of death. If it doesn't offer us this hope, then it is no hope at all; it is not really good news. We are deluded and to be pitied. But then, I do believe! That, my friend, changes everything! Father God, the Alpha and the Omega, the Beginning and the End, I believe that your victory over death in Jesus' resurrection also means my victory over death! I trust that Jesus will raise me up from the dead to share life eternal with you. I cannot tell you how much I look forward to being with you face to face and sharing in your glory and praising your name forever. In Jesus' name I praise and thank you. Amen.